A primary explosive is an explosive that is extremely sensitive to stimuli such as impact, friction, heat, static electricity, or electromagnetic radiation. Some primary explosives are also known as contact explosives. A relatively small amount of energy is required for initiation.eg nitroglycerine. A secondary explosiveis less sensitive than a primary explosive and requires substantially more energy to be initiated. Because they are less sensitive, they are usable in a wider variety of applications and are safer to handle and store. EG TNT,RDX. 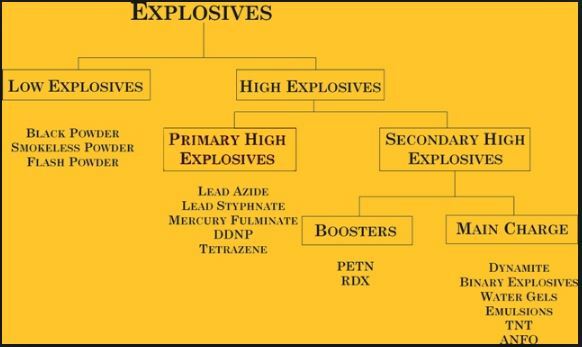 Tertiary explosives, also called blasting agents, are so insensitive to shock that they cannot be reliably detonated by practical quantities of primary explosive, and instead require an intermediate explosive booster of secondary explosive. Sensitivity refers to the ease with which an explosive can be ignited or detonated, i.e., the amount and intensity of shock, friction, or heat that is required. The velocity with which the reaction process propagates in the mass of the explosive. Most commercial mining explosives have detonation velocities ranging from 1800 m/s to 8000 m/s. Stability is the ability of an explosive to be stored without deterioration. The stability depends upon the temperature, exposure to sunlight, electric discharge etc. The term power or performance as applied to an explosive refers to its ability to do work. In practice it is defined as the explosive’s ability to accomplish what is intended in the way of energy delivery. Density of loading refers to the mass of an explosive per unit volume. Volatility is the readiness with which a substance vaporizes.